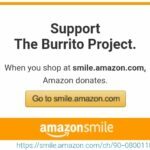 Are you looking for a Burrito Project in LA? Many of the burrito projects in the Los Angeles area serve the homeless in Downtown LA. Here a few to choose from. The South Pasadena and Lincoln Heights locations are just 15 minutes from downtown Los Angeles. We make/assemble the burritos at a food bank then carpool/caravan to Skid Row in downtown Los Angeles to deliver our freshly made burritos. Come join us on the 2nd & LAST Wednesday of every month (In Los Angeles). Our next Burrito Project in Los Angeles/South Pasadena is on Thursday, April 18th, 2019 – 7:30pm. Click here for more details.